There are many variations in modelling too and you need to have special preparation to pursue any form of modelling. Models usually foster a dream to model for the fashion events and shows. Even when that does not seem practical, they turn to modelling for fashion brands or becoming store models. There are better options like modelling for sports brands that they don’t even consider. There are many sports brands that look for fresh faces to model for their sports apparels and accessories. Adidas is one such brand that always has requirement for fresh faces to model for its brand. The requirement for sports brand modelling is however a bit different from the regular modelling. 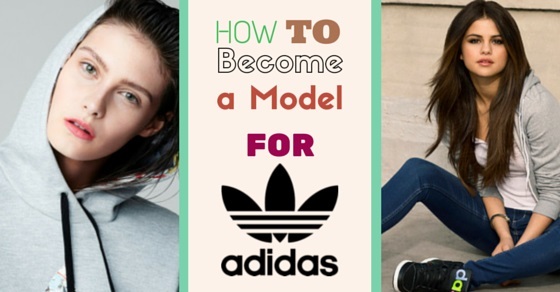 Here we have listed out many steps you may take to start modelling for Adidas. Many times you miss out the closest opportunities because you fail to identify it. Don’t make that mistake if you have an Adidas store in a mall nearby. You must try and contact the store without any hesitation. The best time to contact them is the back to school season and during the vacation time. You need to tactfully enquire whether they are participating in any mall fashion shows. You may speak to the manager and get the details about shows and upcoming events. It will help you know how to increase your scope to be an Adidas model. You may ask them what the other alternatives in modelling for the brand are apart from being shoe models. This way you will get to know about all the opportunities in the brand. Sports brands like the Adidas always look for sports models and frequently come up with store contests to get their pick. If you come across any such opportunity, do not miss it. You need to take it up seriously. If you wish to get timely notifications on such events and opportunities, you may sign up for their mailing list. This way, you will get all their newsletters and press releases and learn about the latest events and modelling contests in your vicinity. There are chances that you win the brand’s new launch merchandise by winning the contest. You need to be aware of the questions you may be asked to fill in the form. It will help you to stay better prepared if such an opportunity comes your way. Here we have listed a few of the major details required. 1. Number of years in training for gymnasium. 2. Do you have any medical condition? 3. Do you have any physical disability? 4. Do you wear braces? 5. Have you learnt gymnastics? 6. Do you know any form of dance? Apart from these, they may also ask for a close-up headshot with your hair tied-up and face smiling. They may also ask for a profile of the face with your hair tied back and full length shots in leotard. These brands always look for fit models so stay prepared to cater to their high demands. You must make sure that all the information you provide in the application are true because they do conduct a follow-up check about the details. Every brand has a unique modelling culture and you need to get acquainted with it to be able to model perfectly. Adidas is a sports brand so they have a modelling culture that is best suited for sports apparels, accessories and garments. You must become experimentative and try out varied styles for your hair. The hair styles may vary from simple pig tails or pony tails to most recent and fashionable hairstyle. You must also try out the varied garments and accessories by Adidas. You may try out their wide range of sports shoes. Once you are comfortable handling these, you will find it easier to model wearing these. Build a portfolio that captures all the traits you possess. You may turn out to be a great pick for fashion as well as sports brand modelling. As with all other professions, experience counts a lot even in modelling. If you are planning to model for a sports brand like the Adidas, you need to make sure that you gain useful experience with other sports brands. It will not just add to your resume but also provide you with knowledge of how these brands work. There are many sports brands options and you can pick any one to gain your experience. The best option would be to go for brands like Nike as they have an entire range of sports products similar to the Adidas. After gaining experience with their competitors, if you apply for Adidas, you will surely be among their selected candidates. Research is vital in every field and this is no different in modelling. If you really want to understand the Adidas brand, you must be willing to do the essential research. You may check out their catalogues and understand the type of models that they hire. Observe their figure and dressing style. Try and maintain a figure like them so that you get the different Adidas assignments. You may check out the Adidas website online and understand what they mention as expectations from their models. You should also observe all the models who do commercials and internet advertisements for Adidas. Over a period of time, you will be able to identify what exactly they are looking for. This understanding helps you inculcate these traits in yourself. If you are really keen on joining the sports brand, show your dedication and approach the stores near you to find out if they hire for modelling assignments. Stay prepared to take up any kind of modelling assignment they give you. This could be your doorway to success. Try and get in touch with people who have already modelled for the brand. They can help you understand the brand better. They may also provide some advice that no one else can give you. Sometimes, there are Tradeshows organized by Adidas. These shows help to create brand awareness among the buyers. These shows could be held anywhere and the brand often looks for appealing fresh faces to model during the shows. You must keep track of such events and shows organized by them. You may try and approach them personally or get in touch with them through the email. They may respond to your mail or even call you for an interview and a whole new opportunity may come your way. While it is sufficient to have an athletic figure, you may also be required to perform athletic feats to be selected for prominent sports brands. They often come up with road shows and events and participating in these can be the easiest way for you to get selected. Keep track of the type of road show events and practice for the same. You won’t be able to perform in road shows if you have not practiced it earlier. A person who aspires to be a sports model should be fit, healthy and athletic. This is really a difficult combination and very few can actually achieve it. Some basic preparatory steps may help you achieve it. Here we have listed it out for you. Healthy food habits help you stay fit and healthy. The junk foods add excessive fat but do not help you gain strength. You need to make sure you eat healthy foods. Include a lot of green vegetables in your diet. Strictly avoid oily foodstuffs. Red meats are harmful and you need to avoid these too. Fresh fruit juices help you stay fit. They also help you have clean and glowing skin. Regular exercise is vital if you want to stay fit. You can develop a habit of early morning jogging. It is a great way to exercise your entire body. You may even try brisk walking as it is known to be very effective in keeping a person healthy. You may even start skipping and playing Badminton. These are other ways to stay active and energetic. You need to practice different kinds of sports as a sports model may be expected to do this for the commercials and advertisements. Regular practice makes you do it gracefully. This makes you an ideal candidate for all kinds of sports modelling. You need to create a profile. You must try and get your pictures clicked in sports outfits and attires. A good profile always attracts and will help you get more and more assignments. These are simple ways to stay fit and healthy. These are vital when you are in a modelling profession.